Absolutely Fabulous Duo – Let Us Entertain You! Introducing ABSOLUTELY FABULOUS DUO, One of Cape Town’s Premier Duos. The band consists of LISA ‘MYNX’ HUGO on Lead Vocals and SEAN ‘STYX’ NUNAN on Drums. Both Sean and Lisa have been playing music professionally since leaving school and understand the Importance of connecting with and entertaining their guests for the entire duration of there performances. Both members are seasoned musicians and have spent years honing their skills as entertainers. 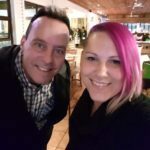 Lisa has an incredible tone and range to her voice and is able to sing almost any style of music while Sean is a sensational drummer having applied his trade for over 25 years.